Google analyst: Broadband connections are "essential infrastructure when it comes to economic growth." Mountain View, California (CNN) -- Google long has been an advocate of a single Web, one that's free of government censorship and barriers to information access. That's not the reality in today's world however. Governments from China to France put various roadblocks in the information superhighway to serve their interests, filter speech or protect copyrights. And high-speed Internet connections haven't reached all corners of the globe -- not even all parts of the United States. To learn more about this split between Google's idea of an all-access Web and the reality today, CNN sat down recently with Derek Slater, one of Google's policy analysts. 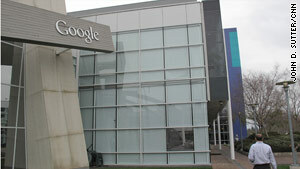 Slater declined to comment on Google's negotiations with China. The search engine has threatened to pull out of the country after the Gmail accounts of some human rights activists were hacked. Since this interview, it has been reported that Google is working with the National Security Agency to prevent similar cyberattacks. But Slater did offer insights about increasing today's sluggish Internet speeds and why a unified Web can change peoples' lives. CNN: What are you expecting from the broadband talks in the United States? Slater: Earlier in the year the FCC [Federal Communications Commission] started its proceedings to create a national broadband plan, and in our view that's a great step in the right direction, to make the U.S. once again a leader in broadband. The Internet was essentially invented here, but over the years we've fallen further and further behind in speed, deployment, penetration. And we think it is essential that there be a national goal to have fast, affordable and open access to the Internet. CNN: What aren't we doing that we should be? Slater: It's a combination of classical and jazz. So there are certain things that we need to do in order to bring faster connections to all Americans, to make sure there's really, truly universal service, and updating the ways in which we do that. Broadband is the dial tone of the 21st century. But there's also a range of experimentation that's going to have to go into this. It's a really difficult challenge to think about how are we going to move not just a step further in terms of the speeds that we're getting today, but a leap further. How are we going to get to 100 megabits per second, a gigabit per second, to homes? There is no silver bullet there. Instead, it's going to take encouraging creative solutions. Some of them will come from the public sector, that is, some of them will involve municipalities or governments. Some of them are going to come from the private sector. And some of them are going to be a mix. CNN: What are the ideas that Google has submitted to the FCC? One other one that we had talked about was encouraging deployment of multiple strands of fiber to peoples' homes. That's because the biggest cost of broadband is digging up the streets, running cables into peoples' homes and so-on. CNN: Zooming back a bit, why is broadband [high-speed Internet] important for the average person? Slater: Broadband is the dial tone of the 21st century. It is essential for participation in civil society and political processes. It's also essential infrastructure when it comes to economic growth and innovation, and job creation. It's also to this century what the beginning of national highways and the electricity grid was for the 20th century. It's going to be an input into a broad range of economic activities. So, as we fall behind, that's also falling behind in our global competitiveness and our global ability to grow our economy and compete as an innovative country. That's why this is a national issue, and that's why broadband is different from average consumer goods. CNN: Why is an "open Internet" important to the globe, or to developing countries? Slater: At this point the benefits of the open Internet are really indisputable. We've seen unprecedented innovation come from that. Not just companies like Google, but all sorts, both commercial and not. The net is also essential to free expression and creativity. It's democratizing the ability for everyone to speak and create. It puts a printing press and a megaphone in everyone's hands. That can reach billions of people potentially all over the world. That sort of democratization of creativity, of innovation, of free expression, is essential to us all, essential to our economy and our society. You can look specifically at the way the Internet today is transforming the way small businesses operate. Through both Google and other platforms they can advertise their businesses, make people aware of what they're doing online, which they couldn't do through traditional media as easily. CNN: Are there limits to how much the Internet can improve peoples' lives? I think improving broadband infrastructure can improve peoples' lives in a number of core areas that are important to our society. Health care. Improving medical treatment. Imagine if someone in rural Montana could do a medical consultation over the Internet with an expert in New York City. Imagine the same thing if we were talking about a student in Iowa [who] could do a distance learning course with somebody miles away, and in that way could improve education. CNN: In watching the first weeks after the earthquake in Haiti, have you thought of any ways tech infrastructure or the Web might be used to help build that country back up? Slater: That's a really interesting question, and I don't have a great answer off the top of my head. I've only seen parts of [the news coverage], but it's been amazing to watch all of the sites that have sprung up to get funding to Haiti. ... Google set up a site to help drive funding there. It's amazing how quickly that stuff can just take root and spread quickly throughout our society. It reminds me in certain ways of the protests in Iran. It was so quick and easy for people there to start snapping photos and tweeting. And that information diffused and spread throughout the world in a very quick way and a way we've never seen before.